When General Leopoldo Galtieri launched Operation Rosario its failure, including defeat and humiliation in the Falklands (or Malvinas) in 1982, would lead to the end of his dictatorship and the tentative return of democracy to Argentina. 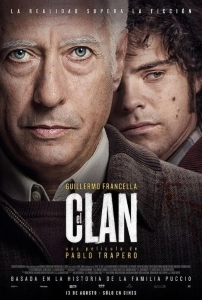 It’s in this period of uncertainty that Pablo Trapero’s new crime thriller The Clan (2015), which screened today at the 72nd Venice Film Festival, is set. Young rugby player Alex Puccio (Peter Lanzani) seems a million miles away from the problems of politics. He’s famed for his speed, enjoys playing the game and also going out with his teammates in order to bathe in public adulation. He lives in a traditional middle-class household in a nice suburb of Buenos Aires. Sisters help each other with their homework; his young brother Guillermo (Franco Masini) obviously adores him; his mother Epifanía (Lili Popovich) teaches at the local school and the gentle patriarch is Arquímedes (Guillermo Francella), a white-haired man with a gentle voice. However, something isn’t quite right and occasionally screams come from the cellar. Arquímedes, with the help of his son and the connivance of the family, kidnaps people. He keeps them in the cellar and, when the ransom is paid, kills them and dumps the body. The first victim we see captured is a wealthy friend of Alex’s. At first naively Alex believes his father was forced to kill the boy when things got rough – a lie. It soon becomes obvious that the gang has a fixed modus operandi, eliminating the victim (or guest) and minimising the risk of getting caught. To make matters murkier still, though the kidnappers use the names of left wing opposition groups when issuing their demands, it is revealed that Arquímedes actually works for the state’s security services and the kidnappings have the blessing, if not following the direct orders, from a high-ranking military officer. Arquímedes visits another kidnapper in prison not to interrogate with him but to commiserate. “Don’t worry,” his friend reassures him. “How long can a democratically elected government last? Two years?” There is something of Scorsese to this rise and fall of a criminal family and Trapero crams The Clan with life. The kidnappings are tensely realised set-pieces and pop songs pound through whole sequences, particularly The Kinks, though the 1960s hit is decades out of period. However, Trapero’s larger political point is the corruption of power and the guises such corruption can take. The violence is perpetrated and masterminded by the quiet old man with the notebook in which he writes down his list of things to do and when he calls the families his patter is polite and calm. Neatly-groomed with piercing eyes, Francella reveals slowly that this exterior of respectability hides an adamantine skeleton of tough inhuman resolve. His ability to control his family and manipulate his children, and particularly Alex, is worthy of Lanthimos’ Dogtooth (2009), but all the more scary for being real. Indeed, the image of the house with the cellar into which people disappear could stand as an allegory for the recent history of the country as a whole. The children once they are old enough to suspect something is wrong long to flee but are always pulled back to the family home. An older brother Maguila (Gastón Cocchiarale), who has been away for two years, comes home and is inveigled into the family business immediately. His father is careful to bribe his adult children with money to start a business for Alex and a camper van for Maguila. With the ruin of his family before him it soon becomes clear that he did not do what he did for the family – the excuse of all gangsters from The Godfather to The Sopranos – but rather used the family to service his own ambitions.